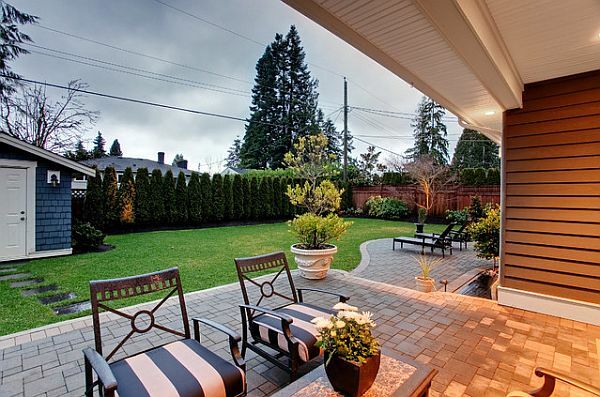 You might think that a nice-looking backyard requires a small fortune in outdoor design, furnishings and gardening. But it doesn’t. If you’re willing to put in a little elbow grease and creativity, you can accomplish a lot with next to no money. Here are some ways to do exactly that. Buying new patio furniture can cost thousands of dollars, depending on where you shop. But getting second-hand furniture and then customizing or refurbishing it can result in a unique look that will feel more like home to you. You might not have to buy anything if you’re willing to learn how to refurbish. Keep your eyes peeled for free castaways at curbsides, especially at the end of the month when leases tend to run out and people move. Also look on Craigslist, under the categories called free stuff, furniture, and garage and estate sales. Reupholster things that are torn — head to your nearest fabric supply store and look in the vinyl section. You’ll also want to shop there make cushions for metal, wooden or plastic furniture that’s initially uncomfortable. If you have a sizeable tree with sufficiently thick trunk and branches to support a swing, the rest is easy. You could go the minimalist route and make the swing with heavy rope and board, or get creative and turn an old wicker chair into a swing. Look around for ideas on how to make your swing have a bit of personality. People aren’t born with a knack for gardening — it’s a skill developed over time. Learn about it and you’ll save a small fortune on landscaping and gardening, assuming you can find the time to do it yourself instead of hiring someone else to do it. Take classes in horticulture at your nearby community college, especially if you reside in one of the growing number of municipalities with free or discounted tuition for residents. Numerous botanical gardens and planting supply shops also offer classes or seminars on gardening that are also free or relatively inexpensive. Read up on the subject as well. Everyone loves to barbeque in the yard, but the cost of new grills keeps skyrocketing, at least on the high end, anyway. Instead of getting a tank-sized grill, opt for something a lot smaller. You could even take it down to the size of a camping grill — the kind that you extend over a fire. You would need to build a firepit and then put the grill over it. Certainly, you could buy that firepit, but then your costs start getting out of control. The nice thing about a camping grill is that you’ll find extra utility from it by taking to the park — or on what else but a camping trip. Then you could store the grill indoors or in your garage during winter.